Are you someone who adores spending time on Pinterest? On Instagram? I know I am. I love a pretty picture, and confess that I am greatly influenced in what I achieve in my day, by how visually pleasing the effect will be, when I am done. ...and toning throw rug, fringing elegantly draped over the antique blanket box that I bought with my very first pay packet 41 years ago. The framed photograph was produced by a local primary school class, for their school fete. I won it by Silent Auction, for just $50. Isn't it the sweetest? ...I assembled an extensive collection of vintage Harlequin kitchen canisters. Different types, but mostly full sets. The anodised metal one at front right you see in the next picture, being the exception. I had some wild idea (not entirely misguided), that I would find mates for that one in my thrift store shopping expeditions. I augmented this with my collection of recycled jars, seen bottom right, which I topped with a rainbow of crystal door knobs. I loved them. Husband less so. He says he doesn't mind a bit of Vintage Charm in the kitchen, but I think he means me...lol! On the occasions when Husband, or my lovely sons or daughters-in-law cook for the family, it's been difficult for them to navigate my Rainbow canisters. The canisters say Flour or Sugar, but which one is Plain Flour or Rice Flour? Which is Raw Sugar and Caster Sugar? Where is the Quinoa? And which canister holds the teabags, and where is the filter coffee kept? Sigh. It sure was delightfully dreamy looking at those sorbet hued canisters, but jeez...not easy to find stuff. ...and I could fulfill my dream of a true French Country Farmhouse kitchen. ...and new clear canisters sourced for just $8 each set of three in graduating heights. ...and now a calm, harmonious arrangement is in place for my extensive array of cooking ingredients. No matter who the designated chef is, ingredients can be found easily, levels checked instantly, shopping lists made simply, and order reigns supreme. It's been a real lesson for me. I was so focused on having a Pinterest Perfect idea of a kitchen, that I neglected to appreciate who uses the space, when and how it's used, and why it needs to be a space where anyone can walk in and find what they need. Sure, it needed to be an area in which I loved to work, but I am not the only one working there! It's now time to pretend I've had a windfall of a longed for appliance or piece of furniture in other rooms of the house, and evaluate those space for functionality, and not just the pretty picture they make. After all, this is my home. Not a Pinterest board. Right? What about you? Are you influenced by the plethora of pictures with which we are bombarded these days? How do you keep your home, yours, in the era of Pinterest and Instagram? Mimi I must confess that I love the new set up with a touch of vintage. I hear you on no one being able to find anything, happens here even though it is in a clear container with a label on it. I ended up putting 'Mum's XXXX' on the containers that housed the items that I use. I moved away from my Tupperware containers when I started smelling the plastic/petrochemical smell when I was opening them. At the time there wasn't much out there so I opted for glass containers I think from Big W or Woolworths at the time. The fact that they were see through worked for me and I used a label maker to put on these tiny labels. A couple of years ago I revamped the jars, rejigged what was being housed in them and redid the labels to chalkboard ones so that my husband could read what was in them. They work perfectly. My only problem now is the small things, spices, essences etc but I have that worked out with some cheap baskets from Kmart and of course I will be creating a label for them. Then all will be OK in my world. Or it would be if I could get the extension done on the house so that I could house my containers in a pantry rather than a bookshelf. My vintage nod is the 3 tier baking container in blue that my mother in law gave me - it was a wedding gift to her from her mother. Being blue it never quite fitted into my mother in laws kitchen (she is a red lover through and through) but it fits perfectly in my kitchen with the touches of blue. Your kitchen looks wonderful, Mimi. Well done. I am not influenced by Pinterest boards of beautiful kitchens as I don't bother about them as I know ours will never look like that. 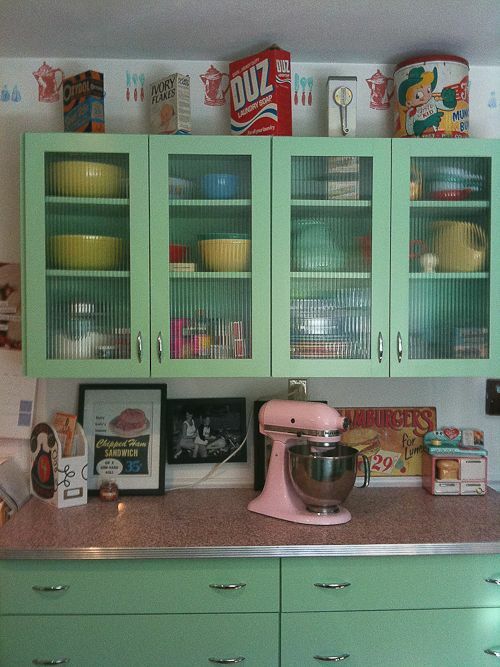 Your pantry is inspiring. Looks like it would be easy to find everything easily. I love glass jars for pantry items, but for me they aren't practical. I found them too heavy, so now I use plastic ones. These are all labelled, and the ones that DH uses frequently are all kept together. As for the rest of the house I am slowly re-jigging it so that it is what we need rather than what we want. Always good to look at things through visitors eyes and see the things that can be improved and act on it. Can't wait to see the full kitchen reno. Ah! Your new containers are perfect and they look beautiful! I love the vintage ones, too. I'm trying to get away from so much Pinterest and trying to make my home 'ours' and loving it like it is! We have a few flooring projects to do, but otherwise it's just fine. I'm trying to stay home more to enjoy my home and to spend time working to make it enjoyable. Love your posts! You have a beautiful home. I love your floors, wow! I think your pantry makeover looks great, and even better that it is more functional. I love seeing the contents of the food, and the black labels look really classy. I know just what you mean about Pinterest. It is great for inspiration and I enjoy the pretty pictures and getting ideas. Oftentimes, though, it takes a critical eye when it comes to practicality. Many times I'll look at a picture and think, "Ooh, how pretty!" But upon closer inspection, I'll think, "But where do they keep their (fill in the blank)?" And so many times, like what you said in a previous post, something will look great in a certain setting but it won't have the same effect in my own space. We all have to do what works best for us. It looks like you have accomplished that, combining both pretty and practical, the best combination. I'm thrilled for you to have such a dreamy stove. It suits you and will serve you well. I think any kitchen with that as the center point HAS to be fabulous. Can't wait to see how it turns out! Dear Mimi, I am big on how things look and also how things smell! There needs to be a pinterest about how things smell haha! Your stove is glorious. So is the pantry! And everything looking clean and shiny is beautiful and satisfying! Oh my, it all looks fabulously organized and I get the point. Finding things is a must. But girl, I would not part with those vintage goodies!! They made my heart skip a beat. I've always done things the hard way, so I don't think I could change now. lol! Thanks for sharing with SYC. The pantry looks great! Those vintage pieces are so cute.